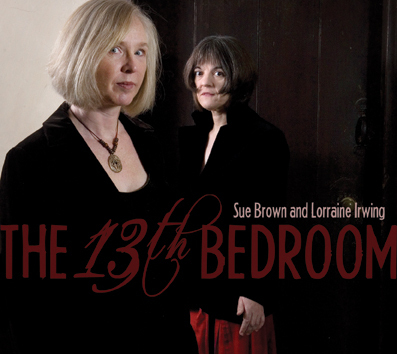 With rich, haunting harmonies, inventive arrangements and an engaging stage presence, Sue Brown and Lorraine Irwing have captivated folk club and festival audiences across the country. Their performances have been described as ‘a blend of voices to melt the heart of an iceberg’, ‘brilliantly stark’, and ‘a rare treat of original and sympathetic treatment of old and new songs’, dealing with the timeless folk themes of ‘death, bonking and sheep’! Their great repertoire includes fine and unusual versions of English songs and ballads, performed mostly a capella, with occasional sensitive accompaniment on guitar, shruti box, Appalachian dulcimer and English concertina. To hear sample tracks or to buy The 13th Bedroom, visit our Recordings page. FRoots say . . . Living Tradition say . . .
Properganda say . . .